Are you a Chaviter or Bieleber? The Internet is torn between these two master <em>#Epals</em>! This brings us to today's final press conference for the much awaited fight happening on May 3 (Manila time). People's champ Manny Pacquiao and the soon-to-be-beaten unbeaten Floyd Mayweather (ahem!) again had a face off. However, unlike the Pacman of the previous presser, our Pambansang Kamao broke into his normal pre-fight smile. Mayweather, on the other hand, still behaved rather uncharacteristically. Bob Arum, who obviously adores Manny as much as we do, took time to tell the story about his goodness. He shared how Pacquiao succeeded in saving the life of Mary Jane Veloso, the Filipina who was supposed to be executed for drug smuggling, by writing a letter to Indonesia President Joko Widodo. He also acknowledged the presence of the “two principal members” of Team Pacquiao–Freddie Roach and Michael Koncz. And because the old man was too nice to cause offense, he also introduced former Ilocos Sur Governor Luis "Chavit" Singson to the crowd. “Look who’s [also] sitting there. The man who has become one of my dearest friends,” said Arum. It came as no surprise to Filipinos that Gov. Chavit was in Las Vegas to support Manny. But it shocked everyone when the 73-year-old politician was summoned to the podium. Chavit in blue checkered polo, grey tuxedo, and orange tinted sunglasses then took the platform. Unlike the Pambansang Kamao, though, netizens weren't as pleased with the Ilokano politician. Their main beef being: WTF is Chavit doing there? Below are the best (read: funniest slash angriest) tweets we found! Ano ka ba kuya? 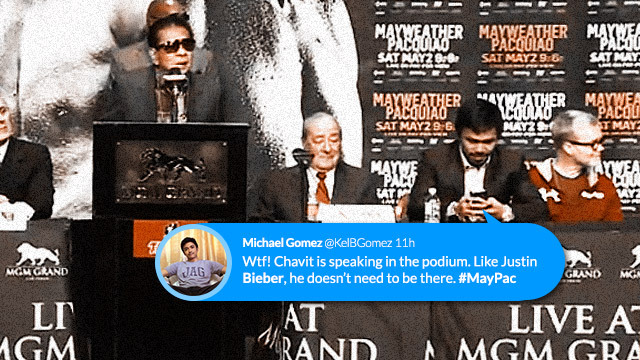 If Mayweather got Bieber, Pacquiao has Chavit!